There was rumor of a possible incident at GHS today during the pep rally that was to be held at the end of the day. As soon as GHS administrators were notified of the situation, they notified the Goshen Police Department and began their investigation. At this point, the police department has searched the building and has set up extra security at GHS. They believe that this threat is not credible and was just a rumor. GHS remains in a lock- in situation as an extra precaution. GMS also chose to be on lock-in status as an extra precaution as well. Standard dismissal procedures, with extra police security, will be in effect. To ensure the safety and security of our students and faculty, and to alleviate or calm any anxiety or fear felt by the students, officers and school staff will continue to treat all leads and tips as if they were legitimate threats. GHS will host a Red Cross blood drive on Friday, October 14th from 8:00 a.m. to 2:00 p.m. in the main gym. Sign-ups are happening this week in social studies classes. If you are interested in winter season cheerleading information it’s posted on the cheer website (https://cheer.goshenschools.org/) and outside the athletic office on the bench. Winter Season open gym will start on Wednesday, October 5th from 4:00-5:30 p.m. at the warehouse. Please contact Coach Kristy or Coach Michelle with any questions. Reminder: IB students, please get your registration forms completed and returned to the bookkeeper in the main office. IHSAA Student-Athlete Tip of the Week: An NFL line coach was reminiscing about a former player and how he was the most coachable athlete he’d ever encountered. Howard Mudd, formerly of the Indianapolis Colts, said, “He was the kind of player that was so coachable that you better not tell him the wrong thing because he’s gonna do exactly what you tell him.” No doubt that coaches respect this kind of athlete. Doing what a coach wants and expects out of you can go a long way in determining your playing time and your value to the team. Can your coach count on you? If you can answer yes, then you more than likely fall in the category of being coachable! GHS is hosting the Elkhart County College Fair on Tuesday, October 4th from 6:30-8:00 p.m. in the cafeteria and Whiteman gym. The fair is open to students from any high school in Elkhart County. All types of colleges will be represented: 2-year, 4-year, tech schools, public and private. Approximately 70 schools, including some armed service branches, will have representatives available to answer questions about what they have to offer. There will also be a Financial Aid meeting at 7:00 p.m. to learn more about the different types of financial aid available and how to apply for them. Homecoming court will be presented at half-time of the football game along with a parade of floats sponsored by GHS clubs and teams. The Mardi Gras Homecoming Dance will be held after the football game TONIGHT from 9:30-11:30 p.m. in Whiteman Gym. We will be selling tickets during lunch for $5 or at the dance for $6. You will need to bring your school ID to be admitted to the dance. If you are bringing a student from another school you must get a permission form from Mrs. Wolfe in the main office. All Key Club members are invited to attend the annual Fall Rally TOMORROW in Columbia City, IN. This is a great opportunity to meet Key Club members from area schools, to participate in a service project and to eat pizza! The cost is $5 at the door and online registration is required. Check your email for a link. Contact Mrs. Dillman if you would like more information about Key Club or the Fall Rally. We are celebrating Hispanic Heritage Month through October 15th! There will be a small exposition in the Commons area with detailed posters appreciating and recognizing each Hispanic country’s culture, traditional foods, geographical landmarks and more! Be sure to stop by and learn something new! If you missed Herff Jones, they will return October 13th from 7:45-8:15 a.m. to take cap and gown/graduation orders. The Ultimate Frisbee Club meets after school on Tuesdays and Thursdays from 3:45-5:00 p.m. on the administration field. If you’re interested in learning how to play the sport of Ultimate Frisbee, you can pick up your required paperwork from Mr. Snyder in the choir office, Mr. Brubaker, Lucas Kauffman, or Mrs. Stealy in the main office. The paperwork should be turned in to Lucas Kauffman the first time you attend. The girls JV volleyball team lost to Plymouth 0-2. The girls varsity volleyball team lost to Plymouth 0-3. The girls freshman volleyball team lost to LaPorte 0-2 and to Plymouth 0-2. In their final home game of the season the Goshen girls soccer team defeated West Noble 8-0. Aylissa Trosper had an epic senior night breaking the school record for goals in a season with a five goal game performance. Aylissa now has 24 goals for the year. Jhoana Gomez, Anne Nisley and senior Kassandra Rodriguez also scored for the RedHawks. Noelia Calderon, Aylissa Trosper, Hannah Kurtz and Aniya Hartzler assisted on the goals. Thanks to everyone who came out despite the rain to honor seniors Aylissa Trosper, Priscila Flores, Kassandra Rodriguez and Julia Macias. The girls finished their regular season with an 11-3-2 record. Goshen opens sectional play at Northridge next week with a first round match up on Tuesday with Elkhart Memorial at 6:00 p.m. The Goshen JV girls soccer team defeated West Noble 4-0. Jocelyn Guevara, Karina Pimentel and Lesly Arellano scored for the RedHawks. Evelyn Santos and Alexia Reina assisted on the goals. The JV girls finished their regular season with an 11-3-1 record and are now preparing to finish their season at the JV NLC tournament at Warsaw on Saturday. Goshen plays Northridge at 9:00 a.m. in a matchup of the two best JV teams in the NLC conference. The varsity boys soccer team defeated LaPorte 7-1. Goshen goal scorers were Marcos Hernandez (2), Lucas Bontreger, Ciro Agular, Danny Isaula, Junior Argueta and Adolfo Villegas. Goshen assists were Junior Argueta, Juan Castaneda, Chris Garcia, Alex Martinez and Marcos Hernandez. The JV boys soccer team defeated LaPorte 5-0. Goshen goal scorers were Saulo Luna, Edwin DeLuna, Chris Losano and Kevin Cruz. Goshen assists were Kevin Cruz, Max Flores and Franco Hernandez. The boys freshman football team lost to Warsaw 28-6. Alex Ubaldo led the way rushing wise for the RedHawks with 50 yards rushing. Dominic Sosa had one rushing touchdown. Bryant Grewe led the RedHawks defensively with multiple tackles. Emanuel Avila had one fumble forced and recorded. Michael Gamez had a quarterback sack. The boys varsity tennis team will host sectional finals at 4:30 p.m. at GMS. The boys varsity football team will host Northridge at 7:00 p.m. The girls JV and varsity volleyball teams will compete in the Dunes Tournament. JV plays at 8:30 a.m., followed by varsity at 10:00 a.m. CST. The girls JV soccer team will play in the Warsaw Invitational at 9:00 a.m. The boys and girls JV and varsity cross country teams will compete in the NLC championship at 9:00 a.m. at Ox Bow Park. The boys JV football team will compete at Northridge at 10:00 a.m. Drama Club News: Congratulations to Nathan Berkey, Grace Bickel, Anthony Beatriz, Christian Elias, Danielle Beard and Eliana Spitler – our newly elected leadership team! Saturday evening students will be going to see Fiddler on the Roof at The Round Barn Theatre in Nappanee. If you wish to go to this show (student pricing) sign up in room 1400 and your $5 is due TODAY. If you don’t sign up, you may not get a discount or be able to purchase a ticket with the group seats. We will have a Homecoming Bonfire TONIGHT from 9:00-10:00 p.m. at the old football practice field by the bus parking lot (by baseball diamonds, off of Monroe St.) Homecoming court will be presented at half-time of the football game along with a parade of floats sponsored by GHS clubs and teams. The Mardi Gras Homecoming Dance will be held after the football game TOMORROW from 9:30-11:30 p.m. in Whiteman Gym. We will be selling tickets during lunch for $5 or at the dance for $6. You will need to bring your school ID to be admitted to the dance. If you are bringing a student from another school you must get a permission form from Mrs. Wolfe in the main office. All Key Club members are invited to attend the annual Fall Rally on Saturday in Columbia City, IN. This is a great opportunity to meet Key Club members from area schools, to participate in a service project and to eat pizza! The cost is $5 at the door and online registration is required. Check your email for a link. Contact Mrs. Dillman if you would like more information about Key Club or the Fall Rally. Goshen’s mayor, Jeremy Stutsman, recently announced the addition of a Goshen City Council Youth Advisor. This position will be filled by a current GHS senior. Today, from 7:30 a.m.-2:00 p.m., the voter registration office will be here with the same voting machines used during the primary and general elections. ALL GHS students (with their school ID) are eligible to vote. The candidates running are: Jacob Biller, Charlie Collins, Natalie Neufeld and Josh Schuster. Boys varsity tennis will host sectional semifinals at GMS at 4:30 p.m. Match 2 will be Goshen vs. Bethany and Jimtown vs. the winner of Match 1 from yesterday. The girls freshman volleyball team will travel to Plymouth to play against Plymouth and LaPorte at 5:00 p.m. The boys JV and varsity soccer teams will play at LaPorte. JV plays at 5:30 p.m., followed by varsity at 7:15 p.m. The girls JV and varsity soccer teams will host West Noble. JV plays at 5:30 p.m., followed by varsity at 7:15 p.m. The girls JV and varsity volleyball teams will host Plymouth. JV plays at 5:30 p.m., followed by varsity at 7:00 p.m. The boys freshman football team will play at Warsaw at 6:00 p.m. Attention German Club members: The votes are in! Congratulations to April Pollock – Sophomore Class Representative, Yareli Hernandez-Abad – Senior Class Representative, Kirsten Graves – Secretary, David Aguilar – Vice President and Lucas Yoder – President. If you are in Miss Bachman’s 5th period class today you will take A lunch. We will have a Homecoming Bonfire on Thursday from 9:00-10:00 p.m. at the old football practice field by the bus parking lot (by baseball diamonds, off of Monroe St.) Homecoming court will be presented at half-time of the football game along with a parade of floats sponsored by GHS clubs and teams. The Mardi Gras Homecoming Dance will be held after the football game on Friday from 9:30-11:30 p.m. in Whiteman Gym. We will be selling tickets during lunch for $5 or at the dance for $6. You will need to bring your school ID to be admitted to the dance. If you are bringing a student from another school you must get a permission form from Mrs. Wolfe in the main office. Tomorrow, in the commons, GHS students will be electing a youth advisor to the Goshen City Council. With your student ID, all GHS students are eligible to vote. SENIORS: There is still time to sign up for the KNOW HOW TO GO! Workshop on tomorrow during the 1st session of SRT in the Auditorium. Remember, you don’t have to be going to a 4-year college to benefit from 45 minutes of your time spent learning more about what you should be doing NOW to transition to life after high school. Once again, topics to be covered are: SAT/ACT, fee waivers, college visits, college application process, important deadlines, College Fair @ GHS, financial aid and filing the FAFSA. Please email your Guidance Counselor so that we can sign you up! ALL GHS STUDENTS & STAFF: As part of College Go Week this week, EVERYONE is encouraged to wear their favorite college spirit wear TOMORROW. Wear your colors with pride! ALL SOPHOMORES, JUNIORS & SENIORS: This week during College Go! Week, you are invited to attend a presentation by an Admissions Counselor from Indiana-Purdue Ft. Wayne (IPFW). No matter what your plan is after high school, please check out what IPFW has to offer as well as knowing what you should be doing NOW. You must sign up in the Guidance Office or email your Guidance Counselor to attend. Sign up NOW! The Goshen girls soccer team lost to Concord last night 4-0. Despite the loss, the girls locked up 3rd place in the Northern Lakes Conference with a 4-3 record. Kassandra Rodriguez had nine saves for the Lady RedHawks. Goshen moved their overall record to 10-3-2. The JV team tied Concord 0-0. The JV girls finished with only one loss in conference at 5-1-1. Goshen’s overall JV record now stands at 10-3-1. The Goshen girls will now host their final game of the regular season this Thursday vs. West Noble. The JV team starts at 5:30 p.m. followed by the varsity at 7:15 p.m. Thursday’s game will be senior night. Everyone is welcome to come out and say a final goodbye to seniors Aylissa Trosper, Kassandra Rodriguez, Priscila Flores and Julia Macias. The boys varsity tennis team will host sectionals at GMS at 4:30 p.m. Match 1 will be Northwood vs. Fairfield. If you are in Miss Bachman’s 4th period class today, you will take A lunch. Her 5th period class tomorrow will also take A lunch. Juniors and Seniors should take advantage of college prep time by coming to the cafeteria after school TODAY from 3:40-4:30 p.m. Ms. Gomez will be there to assist you in filling out the common app, scholarships and essays. Bring your laptops and be ready to work toward your higher education goals! On Thursday, in the commons, GHS students will be electing a youth advisor to the Goshen City Council. With your student ID, all GHS students are eligible to vote. SENIORS: There is still time to sign up for the KNOW HOW TO GO! Workshop on Thursday during the 1st session of SRT in the Auditorium. Remember, you don’t have to be going to a 4-year college to benefit from 45 minutes of your time spent learning more about what you should be doing NOW to transition to life after high school. Once again, topics to be covered are: SAT/ACT, fee waivers, college visits, college application process, important deadlines, College Fair @ GHS, financial aid and filing the FAFSA. Please sign up with your SRT teacher TODAY or email your Guidance Counselor so that we can sign you up! ALL GHS STUDENTS & STAFF: As part of College Go Week this week, EVERYONE is encouraged to wear their favorite college spirit wear on THURSDAY. Wear your colors with pride! The next German Club meeting will be TODAY during the 2nd session of SRT in Whiteman Gym. We will have our officer elections. See you there! The girls JV and varsity soccer teams will play at Concord. JV starts at 5:00 p.m., followed by varsity at 6:45 p.m. Good luck ladies! Congratulations to the Crimson Marching Band for placing 2nd out of 37 bands at the Penn Carnival of Bands Marching Band competition this past Saturday! The group was also awarded the highest music score of the competition. The Crimson Marching Band will be in Toledo, Ohio this Saturday competing with schools from five other states. Best of luck to each of these talented students! Come eat at Culver’s TONIGHT from 5:00-8:00 p.m. and support the boys soccer team. Dine in, carry out or drive thru orders all count! Juniors and Seniors should take advantage of college prep time by coming to the cafeteria after school TOMORRO from 3:40-4:30 p.m. Ms. Gomez will be there to assist you in filling out the common app, scholarships and essays. Bring your laptops and be ready to work toward your higher education goals! SENIORS: There is still time to sign up for the KNOW HOW TO GO! Workshop on Thursday during the 1st session of SRT in the Auditorium. Remember, you don’t have to be going to a 4-year college to benefit from 45 minutes of your time spent learning more about what you should be doing NOW to transition to life after high school. Once again, topics to be covered are: SAT/ACT, fee waivers, college visits, college application process, important deadlines, College Fair @ GHS, financial aid and filing the FAFSA. Please sign up with your SRT teacher TOMORROW or email your Guidance Counselor so that we can sign you up! ALL GHS STUDENTS & STAFF: As part of College Go Week next week, EVERYONE is encouraged to wear their favorite college spirit wear on THURSDAY. Wear your colors with pride! Thank you to all of you that came to see the fall play, The Legend of Sleepy Hollow. We hope you enjoyed the show! The next German Club meeting will be TOMORROW during the 2nd session of SRT in Whiteman Gym. We will have our officer elections. See you there! The girls soccer team tied Fort Wayne Carroll and Homestead this weekend by the same 1-1 score. Aylissa Trosper once again led the RedHawks offense scoring both goals. Noelia Calderon and Hannah Kurtz assisted on the goals. Keeper Kassandra Rodriguez was a beast in goal combining for 25 saves for both games. The varsity girls move their record to 9-2-2 on the season. The Goshen JV team lost two close games this weekend. Fort Wayne Carroll defeated Goshen 1-0 and Homestead won 2-0. Keeper Madison Rittenhouse made seven saves during the two games. The boys cross country team finished 14th at the New Haven Classic Saturday. Jason Barahona paced the boys team finishing 30th followed by Zach Oyer 70th, Felix Perez-Diener 117th, Irving Suarez 134th, Jonathon Snyder 150th, Sergei Culp 153rd and Brian Crain 162nd. The girls cross country team finished 15th. They were paced by Ariana Perez-Diener’s 24th place finish followed by Kirsten Graves 80th, Brandi Smith 157th, Yadira Sanchez 165th, Persis Wade 172nd, Hannah Scott 193rd and Julieta Walton-Clark 195th. The varsity football team lost 43-14 to Warsaw on Friday night bringing our record to 4-2 (2-2 NLC). The JV football team lost 27-7 to Warsaw on Saturday morning. Connor Kulp threw a touchdown pass to Nate Galloway. Brandon Chavez kicked one PAT. Noah Shively recovered a fumble and Jack Immel intercepted a pass to lead the defense. The JV team’s record is 1-5 (0-4 NLC). The girls varsity volleyball team defeated Elkhart Christian on Saturday 3-0 with scores of 26-24, 25-19 and 25-19. The JV team also defeated the Eagles 2-1 with scores of 22-25, 25-14 and 15-11. The boys tennis team finished 3rd in the NLC tourney by two points on Saturday. The 1 doubles pair of Logan Troyer and Bobby Sessa, and 3 Singles player Simon Myers were all champions at their positions and selected to the All-Conference team. Jacob Grewe at 1 Singles was selected to the Honorable Mention All-Conference team. The team starts sectional play this week. We will have a Homecoming Bonfire on Thursday, September 29th from 9:00-10:00 p.m. at the old football practice field by the bus parking lot (by baseball diamonds, off of Monroe St.) Homecoming court will be presented at half-time of the football game along with a parade of floats sponsored by GHS clubs and teams. The Mardi Gras Homecoming Dance will be held after the football game on Friday, September 30th from 9:30 p.m.-midnight in Whiteman Gym. We will be selling tickets during lunch for $5 or at the dance for $6. You will need to bring your school ID to be admitted to the dance. If you are bringing a student from another school you must get a permission form from Mrs. Wolfe in the main office. Come eat at Culver’s on Monday from 5:00-8:00 p.m. and support the boys soccer team. Dine in, carry out or drive thru orders all count! Juniors and Seniors should take advantage of college prep time by coming to the cafeteria after school on Tuesday, September 27th from 3:40-4:30 p.m. Ms. Gomez will be there to assist you in filling out the common app, scholarships and essays. Bring your laptops and be ready to work toward your higher education goals! All Key Club members are invited to attend the annual Fall Rally on Saturday, October 1st in Columbia City, IN. This is a great opportunity to meet Key Club members from area schools, to participate in a service project and to eat pizza! The cost is $5 at the door and online registration is required. Check your email for a link. Contact Mrs. Dillman if you would like more information about Key Club or the Fall Rally. The Animal Aid Clinic South has an opening for a part-time kennel attendant. The position entails a fair amount of cleaning, but also provides an opportunity for education in patient restraint, medication administration, etc. This is a great “foot in the door” opportunity for any student interested in a career in veterinary medicine. Kennel attendants need to be able to work approximately two weekdays (after school) and one weekend day per week. The schedule does include holidays. Those interested can stop by the Animal Aid Clinic South and fill out an application, or can contact Dr. Stacey Dean at animalaidclinicsouth@gmail.com. On Thursday, September 29th in the commons, GHS students will be electing a youth advisor to the Goshen City Council. With your student ID, all GHS students are eligible to vote. SENIORS: As part of College Go Week, seniors are invited to attend a workshop called KNOW HOW TO GO! It will be held in the GHS Auditorium on Thursday, September 29th during the 1st session of SRT. Topics will be standardized tests, the college application process, fee waivers, the College Fair, college visits, financial aid and scholarships. An Admissions Counselor from Manchester College will also be there to answer questions. ALL SENIORS are invited and encouraged to attend, no matter what your plan is after high school. You MUST sign up with your SRT teacher or email your Guidance Counselor before Thursday. Sign up NOW! ALL GHS STUDENTS & STAFF: As part of College Go Week next week, EVERYONE is encouraged to wear their favorite college spirit wear on THURSDAY, September 29th. Wear your colors with pride! ALL SOPHOMORES, JUNIORS & SENIORS: Next week during College Go! Week, you are invited to attend a presentation by an Admissions Counselor from Indiana-Purdue Ft. Wayne (IPFW). No matter what your plan is after high school, please check out what IPFW has to offer as well as knowing what you should be doing NOW. You must sign up in the Guidance Office or email your Guidance Counselor to attend. Sign up NOW! The Legend of Sleepy Hollow is the fall play to be presented TONIGHT at 7:30 p.m., Saturday at 2:00 and 7:30 p.m. and Sunday at 2:00 p.m. Enjoy the haunting tale of Ichabod Crain and the Headless Horseman in the GHS Auditorium. All GHS students pay only $2 per ticket with your school ID. Adults are $5 and those 10 and under are $3. BEWARE, but be there! Attention, GHS! This week is Yearbook Week. To celebrate, 2016-2017 yearbooks are being offered at a discounted rate of $45 per book. This is the LAST WEEK to get a discounted book! After today, book prices will jump to $55. Reserve your copy today at www.herffjones.com. Boys soccer senior/fan appreciation night has been moved to Thursday, September 22nd when they host Warsaw at 6:45 p.m. Pizza will be served halfway through the varsity game. Go Big Red! IHSAA Student-Athlete Tip of the Week: Former soccer great Mia Hamm was once quoted as saying, “Celebrate what you’ve accomplished, but also raise the bar a little higher each time you succeed.” Most athletes that reach the pinnacle of their sport have a knack for doing just that. They remain hungry and stay focused after reaching short term goals. They also think about development and improvement regardless of what happened the day before, good or bad. It’s really a challenge to balance success while keeping an eye on consistent improvement. Those that master that concept will be the ones that succeed when it counts the most! The next German Club meeting will be Tuesday, September 27th during the 2nd session of SRT in Whiteman Gym. We will be having our officer elections. See you there! The Goshen girls soccer team defeated East Noble last night 3-0. Hannah Kurtz, Aniya Hartzler and Aylissa Trosper scored goals for the RedHawks. Alexa Medina and Aylissa Trosper assisted on the goals. The defense recorded their 6th straight shutout. Kassandra Rodriguez had a strong night in goal with four great saves. The Varsity girls moved their record to 9-2 on the season. The girls are in action again this Saturday when they host a double header with Fort Wayne Carroll at 10:00 a.m. followed by Homestead at 2:30 p.m. The JV and varsity matches will both be played at the same time on two separate fields. The JV team defeated East Noble 4-0. Mia Mayorga led the offense with two goals. Joana Regalado and Evelyn Santos also scored for the RedHawks. Evelyn Santos, Jocelyn Guevara and Kayleigh McKee assisted on the goals. The JV team moves their record to 10-1 on the season. The Goshen RedHawks freshman football team lost to the Concord Minutemen in a heartbreaker, 13-12. Kechemy Elias led offensively with 125 yards rushing including a 45 yard TD run. Dominic Sosa also had one rushing touchdown and 60 yards rushing with 75 yards passing. Defensively for the RedHawks, Isaac Claxton had one interception and Oscar Lopez had one fumble recovery. Michael Gamez and Alfredo Alvarez each had a quarterback sack. The boys varsity soccer team defeated Warsaw 4-2. Goshen goal scorers were Marcos Hernandez (3) and Lucas Bontreger. Goshen assists were Junior Argueta, Ciro Agular and Juan Castaneda. The boys JV soccer team lost to Warsaw 0-2. The girls varsity volleyball team lost to Concord 0-3. The boys varsity football team will play at Warsaw at 7:00 p.m. The boys varsity tennis team will compete in NLC finals at 9:00 a.m. at Warsaw. The boys and girls JV and varsity cross country teams will compete in the New Haven Classic at 9:00 a.m. The boys JV football team will host Warsaw at 10:00 a.m. @ GMS. The girls JV and varsity soccer teams will host Ft. Wayne Carroll at 10:00 a.m. The girls JV and varsity volleyball teams will host Elkhart Christian Academy. JV plays at 10:00 a.m., followed by varsity at 11:30 a.m. The girls freshman volleyball team will compete in the Plymouth Invitational at 10:00 a.m. The boys JV and varsity soccer teams will play at Ft. Wayne Carroll at 10:00 a.m. The boys and girls JV and varsity soccer teams will compete at Homestead at 2:30 p.m.
JFL Night is at Foreman Field at 5:30 p.m.
Free Pizza!!! TONIGHT at 6:00 p.m. we are going to have a Parent and Student Workshop in Spanish. Bring your parents to the Media Center to eat while they learn more about college applications and enrollment requirements. You will have the opportunity to sign up for a college visit. Pizza gratis!!! Clase para padres y alumnos hoy a las 6:00 p.m. Ven con tus padres a comer pizza mientras aprendes más acerca del proceso de admisión a la universidad y los requisitos necesarios para ser admitido. Te podrás inscribir para hacer una visita a una universidad. The Legend of Sleepy Hollow is the fall play to be presented TONIGHT and Friday at 7:30 p.m., Saturday at 2:00 and 7:30 p.m. and Sunday at 2:00 p.m. Enjoy the haunting tale of Ichabod Crain and the Headless Horseman in the GHS Auditorium. All GHS students pay only $2 per ticket with your school ID. Adults are $5 and those 10 and under are $3. BEWARE, but be there! Attention, GHS! This week is Yearbook Week. To celebrate, 2016-2017 yearbooks are being offered at a discounted rate of $45 per book. This is the LAST WEEK to get a discounted book! After Friday, book prices will jump to $55. Reserve your copy today at www.herffjones.com. The girls cross country team split wins as they defeated Plymouth 15-50 but lost to Northridge 42-20. Ariana Perez-Diener placed 1st followed by Kirsten Graves 8th, Persis Wade 14th, Brandi Smith 16th, Julieta Walton Clark 17th,Yadira Sanchez 18th and Laura Scott 19th. The boys cross country team split wins as they defeated Plymouth 15-50 but lost to Northridge 47-16. Zach Oyer took 5th followed by Felix Perez-Diener 11th, Angel Arreola 12th, Sergei Culp 13th, Brian Crain 15th, Irving Suarez 16th and Jonathon Snyder 18th. The boys varsity tennis team will compete at Warsaw in the NLC 2nd round at 4:30 p.m. The girls JV and varsity soccer teams will travel to East Noble. JV plays at 5:30 p.m., followed by varsity at 6:45 p.m. The boys JV and varsity soccer teams will host Warsaw. JV plays at 5:30 p.m., followed by varsity at 7:15 p.m. The boys freshman football team will play at Concord at 5:30 p.m. The girls JV and varsity volleyball teams will travel to Concord. JV plays at 5:30 p.m., followed by varsity at 7:00 p.m.
Free Pizza!!! Tomorrow at 6:00 p.m. we are going to have a Parent and Student Workshop in Spanish. Bring your parents to the Media Center to eat while they learn more about college applications and enrollment requirements. You will have the opportunity to sign up for a college visit. Pizza gratis!!! Clase para padres y alumnos este jueves a las 6:00 p.m. Ven con tus padres a comer pizza mientras aprendes más acerca del proceso de admisión a la universidad y los requisitos necesarios para ser admitido. Te podrás inscribir para hacer una visita a una universidad. The Legend of Sleepy Hollow is the fall play to be presented on Thursday and Friday at 7:30 p.m., Saturday at 2:00 and 7:30 p.m. and Sunday at 2:00 p.m. Enjoy the haunting tale of Ichabod Crain and the Headless Horseman in the GHS Auditorium. All GHS students pay only $2 per ticket with your school ID. Adults are $5 and those 10 and under are $3. BEWARE, but be there! Cross country senior night and fan appreciation night starts at 5:30 p.m. TONIGHT vs. Northridge and Plymouth. Any high school student in attendance at 6:00 p.m. will be offered pizza. Boys soccer senior/fan appreciation night has been moved to Thursday, September 22nd when they host Warsaw at 6:45 p.m. Pizza will be served halfway through the varsity game. Go Big Red! The girls varsity volleyball team lost to Northwood 0-3. The boys varsity soccer team defeated Wawasee 9-1. Goshen goal scorers were Lucas Bontreger (3), Marcos Hernandez (3), Chris Garcia, Ciro Agular and Juan Castaneda. Goshen assists were Efren Ortega (3), Alexis Martinez (2), Chris Garcia, Juan Castaneda, Flavio Cruz and Ciro Agular. The boys C soccer team defeated Wawasee 5-0. Goshen goal scorers were Sergio Gonzalez, Luis ‘Miguel’ Mora, Chris Losano, Eduardo Rodriguez and Daniel Alvarez. Goshen assists were Daniel Alvarez (2), Kevin Cruz and Emylio Romo. The boys varsity tennis team will compete in the NLC tourney at 4:30 p.m. at Warsaw. Good luck gentlemen! The Legend of Sleepy Hollow is the GHS fall play to be presented on Thursday and Friday at 7:30 p.m., Saturday at 2:00 and 7:30 p.m. and Sunday at 2:00 p.m. Enjoy the haunting tale of Ichabod Crain and the Headless Horseman in the GHS Auditorium. All GHS students pay only $2 per ticket with your school ID. Adult tickets are $5 and those 10 and under are $3. BEWARE, but be there! Cross country senior night and fan appreciation night starts at 5:30 p.m. on Wednesday vs. Northridge and Plymouth. Any high school student in attendance at 6:00 p.m. will be offered pizza. Boys soccer senior/fan appreciation night has been moved to Thursday, September 22nd when they host Warsaw at 6:45 p.m. Pizza will be served halfway through the varsity game. Go Big Red! All new Stay In Bounds ambassadors are required to attend a 45 minute training session TODAY during the 2nd session of SRT in the main gym. Any returning ambassadors who would like to help with the training should notify Mr. Kissinger. The boys tennis team finished their regular season with a 5-0 win over Memorial on Senior Night. Jacob Grewe at 1 Singles and Simon Myers at 3 Singles each got the double bagel while Hugh Birky at 2 Singles dropped only one game. Logan Troyer had to serve underhand after crashing into the fence, but he and Bobby Troyer still won in straight sets. Nathanael Wertz and Diego Torres finished the sweep with a 7-6, 7-5 result. JV finished their season 6-6-1 thanks to a double bagel win by Mitchell Yoder and an 8-1 win by Nathan Burns and Martin Lyrvall. The boys JV and varsity soccer teams will host Wawasee. JV starts at 5:00 p.m., followed by varsity at 6:45 p.m. Girls volleyball travels to Northwood tonight. The freshman and JV teams play at 5:30 p.m., followed by varsity at 7:00 p.m. The boys and girls JV and varsity cross country teams will host Northridge and Plymouth at 5:30 p.m.
Our teams (Plymouth and Goshen) were tied at 2 matches apiece with the match coming down to our 2S players (Hugh Birky-Goshen, Mitch Rose-Plymouth) that were in a tight match in the third set. After three hours of play and due to extreme darkness, they were forced to stop the match at 5-5 in the third set and move the match to Goshen College, where there were lights available. Our player, Mitch Rose, had been battling cramps the entire third set, before and after the change in venue. At 5-6 in the third set, Mitch came to the net. Hugh hit a passing shot by him on match point and the Goshen fans erupted as Hugh had won the match for his team. Mitch fell to the ground in pain as he cramped up very badly trying to reach for the ball. Instead of celebrating, Hugh immediately rushed over to Mitch’s side of the net to assist him in any way possible as he laid on the ground and had trouble getting up. Hugh brought Mitch his own personal Gatorade to see if he wanted it. Hugh made sure he was OK, and they both congratulated each other on a well-played match. Great sportsmanship all around between the players. Goshen’s coaches checked on Mitch as well, and Coach Love gave Mitch a Gatorade to drink for after the match. It was an excellent display of sportsmanship by Hugh Birky, as well as Coach Love and Coach Saner. It was refreshing to see them show such genuine concern for an opponent in such a highly contested and hard-fought match against a conference rival. Congratulations to all members of the Crimson Marching Band for an outstanding performance at the Concord Invitational! The band and guard had the highest score of all 23 bands at the contest and took home best honors for Music Performance and Visual Performance. We will be in performance at Penn this weekend. Tickets are on sale in the band office. We are celebrating Hispanic Heritage Month through October 15th! There will be a small exposition in the Commons area starting today, with detailed posters appreciating and recognizing each Hispanic country’s culture, traditional foods, geographical landmarks and more! Be sure to stop by and learn something new! Fan appreciation nights at athletic events start this week in conjunction with senior nights. Boys soccer senior/fan appreciation night has been moved to next Thursday, September 22nd. Tonight is tennis and tomorrow is cross country. Free pizza will be given to high school students in attendance to support the teams! Tomorrow night, cross country senior night and fan appreciation night starts at 5:30 p.m. vs. Northridge and Plymouth. Any high school student in attendance at 6:00 p.m. will be offered pizza. Boys soccer hosts Wawasee at 6:45 p.m. for their senior night/fan appreciation. Pizza will be served halfway through the varsity game. Go Big Red! All new Stay In Bounds ambassadors are required to attend a 45 minute training session TOMORROW during the 2nd session of SRT in the main gym. Any returning ambassadors who would like to help with the training should notify Mr. Kissinger. The boys tennis team finally got their match finished against Lakeland after rain caused two different attempts to be rescheduled. Jacob Grewe started things off with an 8-0 win at 1 singles, and the last match of the 5-0 sweep finished right as the rain drops started. They finish their regular season against Memorial tonight which is also Senior Night. Logan Troyer, Bobby Sessa and Simon Myers will all be playing to finish their NLC seasons undefeated. The Goshen RedHawks beat Concord, 28-25. The JV football team lost to the Concord Minutemen, 28-7. Conner Kulp had one touchdown pass. Kaleb Nine had one touchdown reception. Hewitt Nafziger had one interception. The girls varsity volleyball team defeated South Bend Adams 2-0 and Ft. Wayne 2-0. They lost to Elkhart Central 0-2. The Lady RedHawks golf season has drawn to an end but not without a little excitement. The short-handed girls only took four golfers to sectional play at Noble Hawk in Kendallville. When the final Goshen golfer, Olivia Thomas posted her 105, the season was not necessarily over. Olivia Lehr was in the clubhouse with a season best 91 and was in the running to go to the Regionals. She shot 50-41 for the day and it could have been better. In Sectional play, the top three finishing schools advance and the top three individuals advance. Unfortunately Olivia’s 91 was bested but not until the team had to wait for the next three schools to finish. The girls posted a team score of 489 to wrap up the 2016 season. The girls cross country team finished 14th at the West Noble invitational. Ariana Perez-Diener placed 14th followed by Kirsten Graves 66th, Persis Wade 110th, Yadira Sanchez 113th, Brandi Smith 128th, Veronica Qurioz 133rd and Elena Meyer-Reimer 134th. The boys cross country team placed 3rd at the West Noble invitational. Jason Barahona placed 3rd followed by Zach Oyer 13th, Sergei Culp 42nd, Irving Suarez 47th, Felix Perez-Diener 50th, Jonathon Snyder 51st and Angel Arreola 60th. The Goshen girls soccer team had a strong performance at home Saturday evening defeating Fort Wayne Concordia 3-0. Senior Aylissa Trosper once again led the RedHawks offense with two goals. Anne Nisley also scored a goal and Hannah Kurtz had an assist. The defense earned their 6th shutout for the season led by keeper Kassandra Rodriguez with six saves. The girls record now stands at 9-2. The JV boys soccer team defeated Northridge 1-0. Emylio Romo scored a goal for Goshen and Chris Losano had an assist. They lost to Concord 0-5 in the final JV tournament. The boys JV and varsity tennis teams will host Elkhart Memorial at 4:30 p.m. Good luck gentlemen! Fan appreciation nights at athletic events start next week in conjunction with senior nights. On Monday, two slices of pizza will be given to any GHS student who comes to the tennis match at GMS against Memorial. The match starts at 4:30 p.m. and any student who supports the team from 4:30-5:00 p.m. will get some pizza! On Tuesday night, cross country senior night and fan appreciation night starts at 5:30 p.m. vs. Northridge and Plymouth. Any high school student in attendance at 6:00 p.m. will be offered pizza. Boys soccer hosts Wawasee at 6:45 p.m. for their senior night/fan appreciation. Pizza will be served halfway through the varsity game. Go Big Red! From Mrs. Pierce: The theme is red-out today! Because Mrs. Bruder and Mrs. Swihart’s classes are the only ones participating in the 7th period competition we are going to judge a different period. 3rd PERIOD is the lucky period! If your teacher e-mails me I will come visit your class! The boys soccer program is hosting a pork, rice, and bean dinner (chip and salsa included) as a fundraiser TOMORROW from 5:00-7:00 p.m. in the high school cafeteria. See any boys soccer player for tickets. Come out for a good dinner with your family and friends and then head out to our girls soccer home game! The volleyball apparel web store is now available! Items include shirts, sweatshirts, shorts, hats and more. This store is open now and will close at midnight on Sunday, so get your items while you can! The link for the store is: http://tinyurl.com/jcasjzy. Last week the Goshen News and Mayor Stutsman released more information about the Goshen City Council Youth Advisor position. This position will be elected by the GHS student body. If you are a senior and are interested in running for this position, please see Mrs. Clark in room 2280. IHSAA Student-Athlete Tip of the Week: Are you playing high school sports for the pure pleasure of your sport, or are you using your high school experience as a stepping stone to college sports? Getting to the college level can be very challenging. Take football for example. There are 774 college football teams (in all divisions). Most states have anywhere from 200-450 high schools that have a football program. Those numbers show the challenges facing today’s high school athletes who want to move on and play at the college level. This ratio remains about the same, regardless of your sport. The odds are stacked against you. That’s why you should take the time and make the effort to enjoy high school sports. Your sporting days could come to an end at any time! Any student wanting to apply for free/reduced lunch this school year will need to have the forms filled out and turned in before Monday. Forms are available in the main office from Mrs. Haney, the bookkeeper. The girls freshman volleyball team lost to Northridge 0-2 and to Penn 0-2. The girls JV volleyball team lost to Northridge 0-2. The girls varsity volleyball team lost to Northridge 0-3. The boys tennis team beat Plymouth for the first time since 2009, enlisting the 3-set services of Logan Troyer and Bobby Sessa at 1 doubles and Hugh Birky at 2 singles. Simon Myers was the 3rd point at 3 singles. Hugh Birky came back from a set down, and was down 1-4 in the 3rd set before tying it up at 5-5 in the darkness. The match was then moved to Goshen College under the lights, where Hugh won the next two games. Wes Beck was down 2-5 before winning five straight games in the decisive set at 1 singles JV. Mitchell Yoder, Ryan Harmelink, Wyatt Fisher and Josh Haimes also won their JV matches. In a record setting night the Goshen girls soccer team defeated Northwood 2-0. Aylissa Trosper scored two header goals on assists from Anne Nisley. Congratulations to Aylissa Trosper who is now Goshen girls soccer all-time career goal leader with 56 goals! It was also a great night for the Goshen defense who earned their 4th straight shutout. The JV team defeated Northwood 1-0. Karina Pimentel scored the winning goal in the final ten minutes of the game on an assist from Lesly Arellano. The Freshman RedHawks lost to Northwood at Foreman Field at GHS. Kechemy Elias led the RedHawks on offense with 90 yards rushing and a 60 yard touchdown. Dominic Sosa had one rushing and one passing touchdown. James Troyer had one receiving touchdown. Bryant Grewe led the RedHawks defensively with multiple tackles, a couple for losses. Michael Gamez had a quarterback sack. The boys soccer team defeated Northwood 6-0. Goshen goal scorers were Marcos Hernandez (2), Manny Castillo, Ciro Agula, Alejandro Rosales and Alex Martinez. Goshen assists were Lucas Bontreger (3) and Marcos Hernandez. The boys JV soccer team defeated Northwood 1-0. Kevin Cruz scored a goal for Goshen, and Eduardo Rodriguez had an assist. Note time change: The boys varsity football team will travel to Concord to face off against the Minutemen at 6:15 p.m. Boys varsity tennis will compete at Lakeland at 4:45 p.m. The girls varsity golf team will compete in sectionals at Noble Hawk – time TBA. The boys and girls JV and varsity cross country teams will compete in the West Noble Invite at 9:30 a.m. The boys JV football team will host Concord at 10:00 a.m. The girls varsity soccer team will host FW Concordia Lutheran at 6:45 p.m. 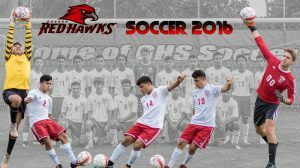 The GHS boys soccer program is hosting a pork, rice, and beans dinner (chip and salsa included) as a fundraiser this Saturday from 5:00-7:00 p.m. in the high school cafeteria. See any boys soccer player for tickets, or pay at the door. Come out for a good dinner with your family and friends, and then head out to our girls soccer home game! A big thank you from the team for your support! From Mrs. Pierce: The theme is red-out this week! Because Mrs. Bruder and Mrs. Swihart’s classes are the only ones participating in the 7th period competition we are going to judge a different period tomorrow. 3rd PERIOD is the lucky period! If your teacher e-mails me I will come visit your class! The boys soccer program is hosting a pork, rice, and bean dinner (chip and salsa included) as a fundraiser this Saturday from 5:00-7:00 p.m. in the high school cafeteria. See any boys soccer player for tickets. Come out for a good dinner with your family and friends and then head out to our girls soccer home game! The volleyball apparel web store is now available! Items include shirts, sweatshirts, shorts, hats and more. This store is open now and will close at midnight on Sunday, September 18th, so get your items while you can! The link for the store is: http://tinyurl.com/jcasjzy. Any student wanting to apply for free/reduced lunch this school year will need to have the forms filled out and turned in before Monday, September 19th. Forms are available in the main office from Mrs. Haney, the bookkeeper. Stay In Bounds Ambassadors will have an organizational meeting TODAY during the 2nd session of SRT in the main gym. Junior student-athletes who have been nominated by a coach will receive an email invitation to come to this informational meeting. Any junior interested who does not receive the email should ask a coach to nominate them. All seniors who were ambassadors last year, as well as those who have spoken with Mr. Kissinger about joining, should also attend. The boys JV and varsity soccer teams will host Northwood. JV plays at 5:00 p.m., followed by varsity at 6:45 p.m. The girls freshman volleyball team will host Northridge and Penn at 5:00 p.m. The boys JV and varsity tennis teams will host Plymouth at 5:30 p.m. The boys freshman football team will host Northwood at 5:30 p.m. The girls JV and varsity soccer teams will play at Northwood. JV plays at 5:30 p.m., followed by varsity at 7:15 p.m. The girls JV and varsity volleyball teams will play at Northridge. JV plays at 5:30 p.m., followed by varsity at 7:00 p.m.
Carly Gingerich: Carly is the daughter of Dave and Marge Gingerich. Carly is ranked 3rd in the state for aces with an ace to error ratio of 3.5. Carly currently has 32 kills, 7 blocks, 142 assists and 65 digs. Carly is a Stay-in-Bounds Ambassador at Goshen High School. She is a 2-year captain for the volleyball team and was named Honorable Mention her sophomore and junior year and MVP her junior year. Carly was awarded the ElkhartCountySports.com Coaches Award her freshman and sophomore year. Carly plans to attend Eastern Mennonite University to study nursing and play volleyball. -Rummel Johnson: Rummel is the son of Michelle and Christopher Wilson. Rummel is ranked 7th in the state for receiving yards with 253 yards and 5th in the state for receptions with 16. . Rummel is also ranked 18th in class 5A for tackles. Rummel is a two year starter and plays wide receiver, outside linebacker, and punt and kickoff returner. Rummel is a member of the National Honors Society, Key Club, Student Council and is an ambassador for the Stay-in-Bounds program. 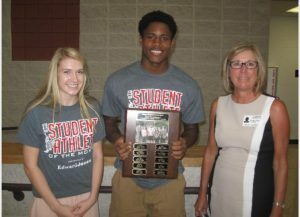 Rummel was named All-State in track, NLC Honorable Mention in football, and was the sectional high jump champion. Rummel is undecided on which college he plans to attend, but plans to study in the medical field. 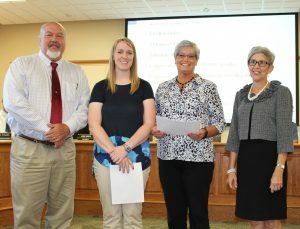 Board Recognition for September 12: GHS Athletic Director Larry Kissinger, Athletic Assistant Kelsey West and Athletic Secretary Jan Schrock were recognized for overseeing all of the many changes that took place in the last year in the GHS athletic department. There have been many new upgrades, additions and improvements, and they have led the way with their hard work and dedication to the student athletes of Goshen High School. Thank you!! Pictured: Board Vice President Jim Ramer, Kelsey West, Jan Schrock, Dr. Woodworth. Mr. Kissinger was unable to attend the meeting, because he was attending an away girls soccer game. From Mrs. Pierce: The theme is red-out this week! Because Mrs. Bruder and Mrs. Swihart’s classes are the only ones participating in the 7th period competition we are going to judge a different period this week. 3rd PERIOD is the lucky period! If your teacher e-mails me I will come visit your class! Any student interested in doing Merit on the Move should contact their guidance counselor. Merit on the Move is an opportunity to earn a credit you are missing after school with an Apex course. Merit on the Move will start TODAY at 3:45 p.m. in the Apex Lab, room 1060. There are still a few spots open. If you are interested, talk to your counselor ASAP. The class meets Wednesdays and Thursdays after school in the Apex room. If you missed Herff Jones, they will return TOMORROW from 7:45-8:15 a.m. to take cap and gown/graduation orders. Students, GET YOUR ORDERS IN to avoid late fees! Stay In Bounds Ambassadors will have an organizational meeting tomorrow during the 2nd session of SRT in the main gym. Junior student-athletes who have been nominated by a coach will receive an email invitation to come to this informational meeting. Any junior interested who does not receive the email should ask a coach to nominate them. All seniors who were ambassadors last year, as well as those who have spoken with Mr. Kissinger about joining, should also attend. The boys soccer C team defeated Bethany, 5-0. Goshen goal scorers were Daniel Alvarez (3) and Jaiden Daniels. Goshen assists were Franco Hernandez (2), Saulo Luna and Eduardo Rodriguez. The boys varsity soccer team defeated Bethany, 5-0. Goshen goal scorers were Adolfo Villegas (2), Marcos Hernandez (2) and Lucas Bontreger. Goshen assists were Juan Castaneda, Chris Garcia and Ciro Aguilar. The boys cross country team was defeated by Warsaw last night 43-17. Jason Barahona led Goshen placing 4th, followed by Angel Arreola 7th, Sergei Culp 9th, Ben Sommers 11th, Irving Suarez 13th, Jonathon Snyder 14th and Brian Crain 16th. The girls cross country team was defeated by Warsaw 43-20. Ariana Perez-Diener led Goshen placing 1st, followed by Kirsten Graves 9th, Persis Wade 19th, Yadira Sanchez 23rd, Veronica Qurioz 25th, Brandi Smith 27th and Julieta Walton-Clark 28th. The Goshen girls golf team finished the regular season losing two matches at McCormick’s Creek in Nappanee. The Lady RedHawks posted a 252 with Olivia Lehr leading the way with a 56, followed by Olivia Thomas posting a 57. Sophia Chupp (68) and first time varsity player, Courtney Sloop (71) rounded out the scoring. Goshen was bested by Jimtown, who had their season low of 198 and Westview, posting a respectable 213. The girls varsity volleyball team lost to Fairfield 3-1. The girls JV volleyball team lost to Fairfield 2-1. The boys tennis team fell to Concord by a score of 2-3, with the final match being decided in a 3rd set tiebreaker. Logan Troyer and Bobby Sessa stayed unbeaten together at 1 doubles and Simon Myers improved to 11-2 at 3 Singles. The Advanced Child Development field trip has been cancelled and all students need to report to class at the beginning of 4th period…..do not go to A lunch. Any student wanting to apply for free/reduced lunch this school year will need to have the forms filled out and turned in before September 19th. Forms are available in the main office from Mrs. Haney, the bookkeeper. Any student interested in doing Merit on the Move should contact their guidance counselor. Merit on the Move is an opportunity to earn a credit you are missing after school with an Apex course. Merit on the Move will start TOMORROW at 3:45 p.m. in the Apex Lab, room 1060. There are still a few spots open. If you are interested, talk to your counselor ASAP. The class meets Wednesdays and Thursdays after school in the Apex room. If you missed Herff Jones, they will return on Thursday from 7:45-8:15 a.m. to take cap and gown/graduation orders. Students, GET YOUR ORDERS IN to avoid late fees! There will be a call out meeting for the Women’s Empowerment Club TODAY during the 2nd session of SRT in Whiteman gym. There will be a College Prep meeting TODAY during the 2nd session of SRT in the main gym. Please bring your laptops with you. The Goshen girls soccer team defeated Westview last night 3-0. Aniya Hartzler, Anne Nisley and Aylissa Trosper scored for the RedHawks. Aylissa Trosper and Aniya Hartzler assisted on the goals. The Goshen JV team defeated Westview 1-0. Jocelyn Guevara scored for Goshen on an assist from Evelyn Santos. The Lady RedHawks dropped two golf matches at Black Squirrel. They lost to Fairfield 249-258 and Mishawaka Marian 220-258. The girls were led by Olivia Lehr’s 58 on Senior night. The lone senior on the team is Megan Fleischer. Megan was forced to withdraw from the event for health reasons. Logan Troyer and Nathanael Wertz scored the lone point at 1 Doubles in a 1-4 loss to 15th ranked South Bend St. Joseph. The JV tennis team tied 6-6 with wins from Wes Beck, Mitchell Yoder, Ryan Harmelink, Josh Haimes, Wyatt Fisher, Anton Pham and Austin Peeler. The Goshen JV football team lost to the Northwood Panthers, 20-12. Kaleb Nine and Hewitt Nafziger had touchdown receptions. Jack Immel had two touchdown passes. Joseph Burkheimer and Sergio Morraz had fumble recoveries. Ian Hostetler had a quarterback sack. The girls freshman volleyball team lost to Northridge 0-2 and to Concord 0-2. The girls JV and varsity golf teams will compete at McCormicks Creek against Jimtown and Westview at 4:30 p.m. The boys JV and varsity tennis teams will host Concord and Elkhart Christian Academy at 5:00 p.m. The boys JV and varsity soccer teams will play at Bethany. JV plays at 5:00 p.m., followed by varsity at 6:45 p.m. The boys and girls JV and varsity cross country teams will compete at Warsaw at 5:30 p.m. The girls JV and varsity volleyball teams will host Fairfield. JV plays at 6:00 p.m., followed by varsity at 7:30 p.m.